Questions relating to the importance of urban public spaces have become key points of discussion in and about cities over the past several years. The revolutionary occupation of Tahrir Square in Cairo and the Occupy Movement’s seizure of Zuccotti Park in New York in 2011, as well as the Gezi Park protests in Istanbul in 2013 raised these issues most prominently. In Kuwait as well, there are signs that the right of public access to common urban spaces is slowly taking hold of people’s urban consciousness. From the pedestrianization of the historic sūq or central market area by the Kuwait Municipality to the occupation of a green space in front of Parliament by political protestors, the question of the population’s right to public space is becoming a growing concern to state and society alike. This article explores the key features that make an urban space truly ‘public,’ and traces the privatization of public spaces in Kuwait after the advent of oil in the 1950s. It then analyzes the growing demand for public space in Kuwait today by contrasting two approaches to the creation of new shared urban spaces: one led by the state and the other by diverse social actors. The view from Egypt is brought in to consider whether the desire to carve out new public spaces in the city is perhaps becoming a regional phenomenon. ‘Public space’ could refer to any space that is accessible to members of the public—so would include places that fall outside the strictly private domestic sphere. One could also perhaps define public space in terms of ownership: places that are state-owned rather than private property. Such definitions are of course flawed: there can be spaces that are privately-owned and yet accessible to members of the public, and places that are publicly-owned but that have restricted access. Not all places outside the private domestic sphere are really public, and not all public places are accessible to everyone. Public space, in other words, is difficult to define. According to urban sociologist Fran Tonkiss, the public nature of a particular site is determined not by ownership but by the sense of public life it embodies, encourages, or produces (2005, 66-68). She identifies three ideal types of public spaces in cities, which in turn capture three different ways of being with others in public. The first type of space consists of public sites of collective belonging in the city, with city squares and parks as the prime examples. Such spaces are often monumental or symbolic but also usually encompass aspects of local and everyday uses, and according to Tonkiss, offer “equal and in principle free access to all users as citizens” (Tonkiss 2005, 67). Common rights to such shared spaces provide a sense of social and political belonging in the city. Sites of informal encounter constitute another kind of public space. This refers to a different way of being with others in public, in mostly unplanned, incidental, and mundane interactions. This is the kind of space that people share not so much as a symbol of collective belonging, but more simply as a matter of fact. The most basic example of this kind of public space is the street—or specifically sidewalks—as well as modes of public transportation like buses or metros. The everyday interactions that occur in spaces like squares and parks can also fall into this category of public space when they are not serving collective functions. In such public spaces, people are constantly negotiating strangers in repeated marginal encounters as they go about their daily lives and routines. The third kind of public space Tonkiss identifies is the space of deliberate social exchange and interaction. These are the kinds of public places that people go to specifically to see and visit with others, epitomized by the café. This includes public sites that are marginally profit-oriented but that are not entirely governed by consumption—in that, although you often spend money there, consuming is not the sole or even necessarily the primary purpose of the space. Museums and cultural centers, cafés that include other functions like study areas or performances, and cultural salons may fall into this variety of spaces of social exchange. A key feature that enhances the public life of a particular urban space is the integration of mixed uses and activities; when the use of a space is not limited to one single function or activity, no matter how ostensibly it might appear to the contrary. For instance, the principal function of a neighborhood farmer’s market is of course commerce, but it is also a weekly gathering place for residents to meet and listen to live music, for community groups to distribute flyers or get signatures on petitions, and so on. A mixture of activities and uses in a given space often results in the presence of a wider variety of people of different backgrounds, ideologies, and ways of life. In other words, diverse activities allow for greater contact and interactions with, among, and between diverse people, even if those encounters are marginal and seemingly trivial. When a space is limited to a single use, it restricts the variety of people who use that space and therefore diminishes the kind of public life—again, different ways of being with others in public—that could otherwise occur there. In particular, spaces that focus predominantly on consumption—that is, where consuming food, commodities, or recreation and leisure for money is the principal activity—are not truly public even if they are technically open to a free flow of visitors. For this reason, although they are open to the public, shopping malls do not fall neatly into Tonkiss’ three-part definition of a public space—not only because they are privately-owned and governed, but also because they serve a single purpose (consumption) and often restrict alternative uses (e.g. cultural activities or political advocacy). Mall owners can also use different tactics to restrict the kinds of people who enter their property, such as only selling high-end brands, using security guards to stop young men or laborers from entering, and so on. Kuwait’s urban landscape before the advent of oil urbanization in 1950 reflected the townspeople’s publicly-oriented lifestyle. As a port town, the seafront (saḥil), harbors, sūq, and the open-air Bedouin market in the Saḥat al-Safat (the main town square) were the centers of the town’s mercantile and maritime economies. But, as Farah Al-Nakib has shown, they were also the main spaces of social exchange and political discourse that, as public spaces, conformed to Tonkiss’ three-part typology discussed above (2014a). With the launch of its oil industry in 1946 and the advent of modern planning in 1950, Kuwait underwent a rapid, state-led modernization process that resulted in the complete transformation of the urban landscape. As the population was suburbanized en masse, the city was transformed into a landscape of state power and ceased to be a center of everyday social life or political discussion as it had been prior to oil. Decades of suburbanization and functional zoning coupled with both the eradication (through street widening and other spatial developments) and the economic and cultural privatization of formerly public urban spaces resulted in a substantial decline in public life. Over the past 65 years since the advent of modern city planning, Kuwait City has become highly privatized, dominated by shopping malls, private beach clubs, segregated suburbs, and privately owned vehicles. With access to state subsidized housing, most Kuwaitis live in detached suburban villas rather than apartment buildings (while most non-Kuwaitis live in the latter). Buses are the only form of public transportation, and they are predominantly used by lower-income foreign workers. Because of insufficient designated or off-street parking in most commercial areas, sidewalks and open spaces tend to be transformed into improvised parking areas, hindering the city’s walkability. Although some public beaches and parks were developed beginning in the 1970s, these public recreation areas have always been tightly controlled and their uses are being increasingly commercialized. For example, when the Municipality first began to develop the long stretch of waterfront running from the city center to the southern tip of the country’s large natural bay in Salmiyya in the 1980s, there was an emphasis on a public return to the seaside. Although some of the projects that were developed before the Iraqi invasion of 1990 were indeed public, they focused on a more privatized form of interaction: an indoor swimming pool complex, a yacht club, the artificial Green Island recreation center, and so on (Al-Nakib 2016, 159-60). Taking this privatization of the public seafront even further, from the late 1990s onwards, shopping malls, private clubs, and restaurants became the dominant features of the coastal strip. Nonetheless, the landscaping of the seafront corniche between these developments and the water created a quasi-public area that now attracts a variety of users: people walk, run, and cycle along the paved areas, while many families, particularly expatriates and lower-income Kuwaitis, use the few sandy beaches and stretches of grass along the Gulf Road for picnicking on evenings and weekends. But in 2012, Parliament passed a law banning barbeques and picnics in public places such as beaches and parks. The justification was the high volume of trash and burned grass left behind, but, as Al-Nakib argues, “such rules contribute to purifying the [coast] of unplanned activities that do not conform to the area’s predetermined, largely consumerist, uses. They also remove the few options available to the country’s majority non-elite population for free, public leisure” (2016, 210). The privatization of urban space in Kuwait (as elsewhere), again, not only signifies private ownership; it also relates to the kinds of experiences one can have in a particular space that is open to the public. As mentioned above, spaces like shopping malls that, in theory, are free to enter often employ diverse tactics to restrict the kinds of people that walk through their doors. Other places, like clubs or recreational facilities, often charge memberships and/or entrance fees. In the few places that remain truly public, strict rules govern how people can use the space. Such restrictions result in the presence of much less diverse crowds, and provide few ways of, and opportunities for, being with others in public, which again is how Tonkiss defines public space (2005). As a result, residents of Kuwait have few opportunities to encounter and interact with people that are different from themselves—even on quite marginal levels—and their ability to coexist with diversity has therefore significantly diminished over the years. As Al-Nakib argues in her new book Kuwait Transformed: A History of Oil and Urban Life, the result is a society that is increasingly xenophobic and intolerant towards different people, and to ideas and ways of living that do not conform to the dominant cultural ethos (2016). Given the extreme privatization of public space and public life in Kuwait over the past six decades, the sudden and simultaneous emergence of two new public spaces on the Kuwaiti landscape over the past two years (both established in 2014) reflects a unique moment in the city’s post-oil urbanism that warrants deeper analysis. One principal feature that makes both spaces particularly unique as public spaces in Kuwait is that they encourage broader participation in spatial governance than has been the norm over the last 65 years of oil urbanization. Therefore, they potentially represent a new paradigm for Kuwaiti urbanism, although the two spaces embody two highly divergent approaches to governance and management. Alshaheed Park (Alshaheed Park, 2015). Once completed in early 2015, the Diwan handed over management of the park to the Lothan Youth Achievement Center (LoYAC), located inside Alshaheed Park, in order to give Kuwaiti youth the opportunity “to help cultivate and nurture the arts, history and culture” by organizing events in the park. LoYAC is also responsible for the park’s maintenance, cleanliness, and security. The space therefore represents the Kuwaiti state’s first attempt at encouraging broader participation in the management and governance of public space. The second space is the citizen-run Secret Garden (officially Baghdad Park) located in the mixed commercial and residential district of Salmiyya. The garden encompasses an area of approximately 2,000 square meters, nestled between commercial and residential buildings. The space was derelict until a small group of people—Kuwaitis and non-Kuwaitis, some of whom are residents of Salmiyya—began cleaning up and reinvigorating the space in September 2014. On a strictly voluntary basis, neighbors and friends began meeting in the garden every weekend to plant vegetables, herbs, flowers, and plants. They dug a compost pit in one sector and built picnic tables and benches in another. Every other Saturday, the volunteers host a small street market in the garden called Shakshooka, where a limited number of vendors sell food and homemade products to neighbors and visitors, accompanied by live music. The volunteers use the vendors’ fees to maintain the garden. The garden is also often also used to host free public events that anyone can organize and attend (cooking classes, theater workshops, etc.). Prior to these protests, only two political movements had protested in the city since the Arab nationalist demonstrations of the 1950s. The first was the successful campaign for women’s suffrage in May 2005, and the second was the youth-based Orange Movement, also known as the ‘Nabeeha 5’ (‘We Want Five’) campaign, in 2006. Nabeeha 5, which also succeeded, focused on reducing the number of voting districts in Kuwait from twenty-five to five in an effort to curtail political corruption (like candidate vote-buying). Since both movements were aimed at the legislative branch (in that they aimed to change laws), the protestors occupied a landscaped space between the Arabian Gulf Road and the seafront corniche, facing the Parliament building. In the 2006 campaign, this space became known as Irada (Determination) Square. The 2011 opposition, by contrast, was protesting against financial corruption among top politicians, particularly the prime minister, rather than calling for particular legislative changes. Therefore, they initially planned to hold demonstrations in the city’s historic central square, Saḥat al-Safat, an open plaza adjacent to a major traffic junction in the central business district. Al-Safat was mostly a symbolic choice, as it had been a key site during Kuwait’s first major political opposition movement against the ruler in 1938. But before the demonstrators had a chance to occupy the space in 2011, the Municipality quickly boarded it up to undergo a planned renovation. The protestors were restricted to a less central, more controllable (with only one access road), less disruptive, and less historically charged Irada instead, which became the site of numerous political demonstrations over the ensuing years. The struggle over al-Safat and the eventual appropriation of Irada brought attention to the lack of truly accessible public spaces in Kuwait, as well as the right of the public to decide what spaces in the city may be used for what purposes. Irada represented not only the state’s long-held policy of controlling access to certain public areas, but also the public’s first attempt at reclaiming access to public space after decades of privatization. Though ostensibly apolitical, the appropriation of Baghdad Park and its transformation into the Secret Garden can be seen as a continuation of the process to reclaim public space set in motion by the protesters in Irada. Meanwhile, in the wake of the highly contentious political opposition movement of 2011 (and the simultaneous uprisings occurring elsewhere in the region), the Kuwaiti government made a more concerted effort to engage Kuwaiti youth in the political process, in order to discourage them from joining opposition forces. The Amir formed the Kuwait Youth Council to give young Kuwaitis the opportunity to identify what they saw as the country’s biggest problems, and to come up with solutions to be presented to the ruler. This was considered a preferable method to voice their concerns rather than taking their grievances to Irada. Alshaheed Park similarly gives Kuwaiti youth a large space that provides them with a sense of participation and engagement, but in a much more secure and controllable manner than Irada. It must be noted that the renovated Saḥat al-Safat reopened at the same time as Alshaheed Park in early 2015, yet the historically open space (the name ‘Safat’ comes from the Arab root word ‘safa,’ meaning clear) is now gated and locked at all times, and may only be used for official events or with prior state permission. Cities need large-scale, planned public projects like Alshaheed Park as much as they do smaller, more organic, and community-oriented spaces like the Secret Garden. As two unique and parallel projects, both places encourage not only mass use but also broad participation in the management of public space in Kuwait. They are also similar in that neither is (yet) governed by consumption (that is, neither space is driven primarily by the generation of revenue). However, despite their similarities as public green spaces, the two projects retain stark differences. The Secret Garden was cleaned and renovated and is permanently maintained entirely by neighbors and volunteers at their own expense, using mostly upcycled materials and donated or found objects (including at one time a toilet bowl used as a planter). Alshaheed Park, by contrast, employs dozens of workers at both the labor and managerial levels and cost millions of dinars to complete and maintain. The Secret Garden has no barriers and is easily accessible to pedestrians, yet it is located in a nondescript corner of Salmiyya (if you don’t know it is there, you might miss it). Alshaheed Park, on the other hand, takes pride of place on the city’s historic Green Belt, a feature that officials have used to market the space. It is also gated and accessible predominantly by car, as it is bordered entirely by highways and main roads. As a highly controlled space, Alshaheed Park reinforces class and national divisions common in most other public places throughout the country. With car access through an underground parking garage and pedestrian access through a gate with security guards, it is conspicuously inaccessible to the vast majority of people who actually live in the adjacent city center: male migrant laborers. Though the park does not yet charge an entrance fee, park officials are considering imposing a nominal charge in order to ensure that the park remains ‘well-maintained and secure.’ The underground garage also contains ticket barriers that are as-yet unused but suggest a future possibility of paid parking. There are also strict rules governing the park’s uses: picnics, barbeques, ball-playing, and other common outdoor leisure activities are prohibited, and all group activities containing more than five people require formal permission. Map of Alshaheed Park (Alshaheed Park, 2015). Although Alshaheed Park is distinct from previous public parks in Kuwait in that it was created by the Diwan al-Amiri rather than the Public Authority for Agricultural Affairs and Fish Resources (PAAF, which governs all other public green spaces in Kuwait), it mimics the long-existing policies governing parks in Kuwait. When three new public parks were created in the city center in the early 1970s, they were designed to beautify the city rather than to serve public needs. They were closed during the daytime in order to be irrigated, cleaned, and maintained. By the time the parks opened at 4:00pm, the majority of people who worked in the city center had retreated back to the suburbs for the remainder of the day. The parks also had two-meter-high boundary walls and employed full-time guards to protect them from misuse. Running, sports activities, ball games, and bicycles were prohibited, as the priority was to protect the park’s landscaping rather than to satisfy public demand. With similar rules and restrictions governing its own uses, Alshaheed Park further limits the possibility for a truly public urban life in Kuwait. But Alshaheed significantly deviates from previous public parks (and most other state projects) in the Diwan’s creation of a youth-based and participatory management structure, which makes the park a lively and dynamic place that hosts multiple activities, such as musical performances, public lectures, book readings, organized sports activities, yoga groups, and so on. Although most of these activities require administrative permission and planning, the focus is on encouraging public use rather than simply maintaining the park’s aesthetics. The New York-based Project for Public Spaces, an NGO dedicated to helping people create and sustain public spaces that build stronger communities, notes that “80 percent of the success of a public space is the result of its ‘management,’ referring to how the space is maintained and activities programmed. In other words, even in the best-designed spaces for public interaction, activities need to be planned, and the space needs to be clean, secure, and well maintained, or it is unlikely to serve people well” (Borrup 2005). Putting LoYAC in charge of Alshaheed’s events and maintenance has ensured that, despite the strict controls over its use, the park is nonetheless active and serves multiple people in various ways (which few other large public parks in Kuwait can claim). The Secret Garden differs from Alshaheed Park in that it is an entirely uncontrolled space that encourages mass use and participation. Rather than reinforcing national and class divisions, the garden helps bridge the gap between Salmiyya’s Kuwaiti and non-Kuwaiti residents and visitors by encouraging community participation in its activities (Salmiyya is one of Kuwait’s only mixed residential areas). Although no single group fully controls the space and anyone from the public can use it in any way they desire, a core group of volunteers work cooperatively to manage and maintain the space. As a public green space, the Baghdad Park falls under the auspices of PAAF. But before the volunteers began to revive it and transform it into the Secret Garden, it was an overgrown, derelict space that no longer had functional water mains or electrical power. The volunteers coordinate closely with state officials in various ways (e.g. getting the Ministry of Water and Electricity to fix the park’s infrastructure), and PAAF has appointed three active volunteers as custodians of the garden on behalf of the institution. Although they do not control the space in the way that LoYAC controls Alshaheed Park, they are the principal public actors responsible for keeping the garden active and maintained. Alshaheed Park differs from other large-scale state projects in that a civil society group (rather than a state bureaucracy) runs the park. The Diwan al-Amiri appointed local young architects to design many aspects of the place (another anomaly in a country where most state projects employ foreign planners and architects), yet the creation of the park was an entirely top-down initiative, as was the decision to hand it over to LoYAC. Alshaheed is largely a continuation of Kuwait’s state-centered planning paradigm. The Secret Garden, on the other, represents an entirely new form of bottom-up, cooperative urbanism in Kuwait. It is also linked to other new initiatives in Kuwait that are redefining prevailing conceptions of public and private space. Shakshooka began as a small farmer’s market well before the Secret Garden. However, strict laws restricting the use of public land for commercial purposes meant that for years the handful of vendors operated as a sort of guerilla market, setting up in a different location each week and only announcing the location the morning of the event, on social media. In this way, they were largely able to avoid state obstruction. Shakshooka started a food market trend in Kuwait, with another much larger food and farmer’s market, Qūt, launching in late 2013. However, Qūt’s organizers chose a different path; rather than flouting the law governing public spaces, they opened in various private spaces—first on the top floor of a high end mall’s parking garage in the city, then in a new outdoor commercial development area, and finally in the outdoor space of a private apartment complex. The organizers of Shakshooka, by contrast, wanted to remain public, and finally settled in the Secret Garden. However, once state authorities caught wind of the market, they attempted to stop it, invoking the law against using public land for commercial purposes. The volunteers have been resilient and have refused to back down, though it remains unclear who will ultimately win this ongoing battle. If the volunteers successfully convince the authorities to allow the market to continue, it will considerably loosen the state’s control over how people can use public space in Kuwait. In addition to small farmers, most of the vendors in these markets operate home-based businesses which specialize in food, hand-made crafts, and design. Because private homes are constitutionally protected from state intervention or control, home-based businesses are illegal in Kuwait because they cannot be monitored or regulated by the Municipality or Ministry of Commerce like other businesses (particularly food-based ones). But the trend in home businesses has grown so quickly that a group of these entrepreneurs are now working to amend the law, to allow for businesses to operate out of private houses. Just as the food markets are challenging how people think about and use public space in Kuwait, so the connected push to legalize home businesses is reconfiguring how we think about the most inviolable of private spaces, the home. Is Carving out Public Space a Regional Urban Phenomenon? In Cairo, the political act of occupying Tahrir Square—and later, other streets and squares—was not the only manifestation of the struggle over public space since 2011. In many urban districts, people have been rediscovering their right to accessible, affordable, and clean public spaces for all. One example lies in Zamalek Island, which contains many well-designed and maintained parks that were nonetheless underutilized and needed more attention. The revitalization of the area’s parks as public spaces belonging to Zamalek’s largely middle and upper class residents was—and still is—at the top of the agenda of the Zamalek Association, an NGO founded by a few residents in 1991. The association has been “reinventing itself” since 2012 by trying to attract new members and organizing local meetings. It has also represented Zamalek residents in many public participatory events in the last few years, most prominently in the public meetings with the National Authority for Tunnels (NAT) discussing the new metro line plan. The NGO has established an internal committee dedicated to revitalizing of the Aquarium Grotto Garden, the historic park established in the late 19th century. The committee largely invested in the physical restoration of the Aquarium Grotto Garden. In 2013, it completely renovated the Children’s Playground, the parks restrooms, mosque and drinking fountain. It has also been involved in the park’s solid waste management and plant and tree maintenance since then. It recently obtained approval from the Ministry of Agriculture to commission a study for an overall restoration of the park. Additionally, the Zamalek Association has been organizing many events such as the ‘Taste of Zamalek’ at the area’s public parks, especially the Aquarium Grotto and al-Hurriya Park, that involve food, music performances and markets. The events aim to bring the community together, encourage residents to enjoy their leisure facility, and also to introduce them to the association’s work. ‘Taste of Zamalek’ community events organized by the Zamalek Association at the Aquarium Grotto Garden (Zamalek Association, 2013). In a similar vein, the Heliopolis Heritage Initiative (HHI), a local watchdog group founded in 2012 to revive and protect the quality of life in Heliopolis, protects the Merryland Park and its century-old trees. The Merryland Park is the area’s largest and most iconic public space, that was established at the beginning of the last century as a hippodrome (horse race course) and was turned into a park in the early 1960s. The Park became one of Cairo’s principal open public spaces during the following decades. By the early 2000s bad management and minimal maintenance resulted in the park’s deterioration, and it became less popular among Cairenes, particularly with the emergence of shopping malls and consumption-centered spaces. The Heliopolis Company, a state-owned company founded as a private company and nationalized after 1952, owns Merryland Park. Today, the company is a subsidiary of the Holding Company for Construction and Development (HCCD). In 2012, the Heliopolis Heritage Initiative submitted a petition to Parliament reporting environmental violations—the destruction of century-old trees—by the Heliopolis Company. After plans emerged in 2015 to upgrade the park and transform it into a place for expensive consumption activities, the Heliopolis Heritage Initiative fought to keep the park public and affordable, with the support of many of the area’s residents. As a result of HHI’s efforts, the Governor of Cairo and the Minister of the Environment took action to include HHI in negotiations with the Heliopolis Company on the future use of the park. Most recently, newspapers reported that the Heliopolis Company will maintain 22 feddans of greenery in Merryland Park and also build an amphitheater in Granada—another public space it manages in Heliopolis—with the involvement of the residents. However, the participatory mechanism and limitations are not clear. Moreover, there are no guarantees that the company’s plan will be implemented and the advocacy efforts of the watchdog initiative continue. Merryland Park during the ‘tree massacre’ (Deyaa, 2015). Compared to the relatively well to do areas of Zamalek and Heliopolis, gaining access to public space in less-privileged areas in the GCR presents residents with more daunting challenges. Ard al-Liwā, an informal area in Giza, suffers—like many other areas—from the severe lack of parks and recreational spaces. The strong Egyptian tradition of picnicking, at certain times of year for specific holidays (Sham Al-Nasiim), means that families pore on to every available green space or public space to celebrate, sharing specific foods for the holiday. For many low-income families residing in neighborhoods largely devoid of public space, the only green spaces available to them for picnicking are very small spots of greenery in traffic circles and other paved areas of the city’s streets. In Ard al-Liwā(a lower-income informal area in Giza Governorate) a group of residents known as the “Popular Coalition of Ard al-Liwā” began advocating for access to public space in the community in 2012. Ard al-Liwā suffered from a paucity of available land for public use. The Popular Coalition identified a 14 feddan dilapidated property belonging to the Ministry of Awqaf (Religious Endowments) and, with the expertise of a young architect among its members, put together a plan to redesign the land to serve the community. The design proposed transforming the area into a complex of public spaces, including a garden, a sports club, and a cultural venue. They have been negotiating with the government to realize their plan since 2012. They reached out to their local member of parliament, Amr Al-Shoubky, in 2012 for political support, and the architectural firm CLUSTER provided technical support. The coalition met with various government officials, both local and national, including the Prime Minister in 2012, Kamal El-Ganzouri, and the Minister of Housing (later Prime Minister) Ibrahim Mahlab in 2013. The coalition succeeded in encouraging the government to transfer this piece of underutilized property from the Ministry of Awqaf to the Giza Governorate, bringing their plan one step closer to realization. However, nation-wide political changes that occurred in 2013 and onward halted the project and Ard al-Liwā continues to suffer from a lack of public space. Similar to Alshaheed Park in the case of Kuwait, Cairo was also recently home to a state-run project to provide public space along the waterfront. The “People of Egypt Riverwalk” project is a development plan for the Nile Corniche implemented by the Cairo Governorate and the Ministry of Water Resources and Irrigation. It aims to create an accessible and affordable public space for city residents along the cherished Nile River and to protect certain areas of the riverbank from potential privatization in the future. It is also designed to discourage informal activities like feluccas (small commercial sailboats) and street vendors from operating in this newly developed area. This raises a legitimate question about who should pay for the price of the development and whether or not the public interest really includes everyone, as these feluccas are a popular, affordable leisure outing for many mid-income Cairenes. However, many of Cairo residents welcome this project because if the plans are implemented as announced, they will be able to enjoy a very important public resource; the banks of the Nile River. The need for public spaces in cities is about much more than simply having access to open space. 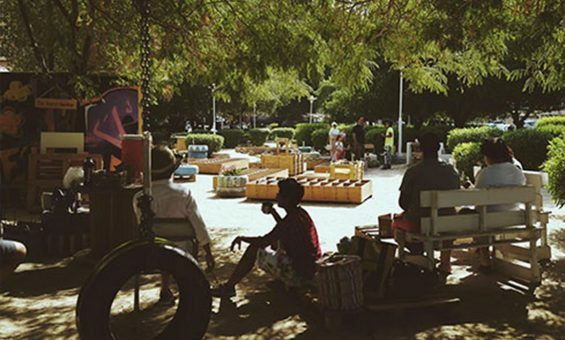 Public spaces contribute to the creation of the ‘commons,’ a concept that not only means common property resources or collective spaces that all city residents share but also includes “social activities involved in production and community building, and experiments in living that we create together” (Bockman 2016, 67). David Harvey makes an important distinction between public spaces (streets, sidewalks, squares) and public goods (sanitation, water, public health, education) on the one hand, and the urban commons on the other. While the former are of course commonly shared, it takes political action on the part of the people, not the state, to appropriate public spaces or public goods and make them part of “the commons” (Harvey 2012, 72-73). So, the space in front of the Parliament in Kuwait (like Tahrir Square in Cairo) existed as a public space before 2006, but it became part of an urban commons once people began to gather there “to express their political views and make demands” (Harvey 2012, 73)—when it was unofficially named Saḥat al-Irada. Similarly, the Secret Garden was a derelict public space before 2014, but became part of an emerging commons when a community came together to create a space that better served their needs and desires. Privatization, the creation of spatial enclaves and enclosures, surveillance, controls over the use of space, and other urban processes that primarily serve capitalist class and/or state interests negatively impact the quality of urban life and social relations in cities across the world (Harvey 2012, 67). A revival of the commons can help reverse that process and improve the social life of cities, particularly in places like Kuwait and Cairo with substantially large youth populations who increasingly express frustration with the status quo, in cultural as much as political realms. Public spaces are essential to this ‘commoning’ process. But they cannot simply be planned by design with a guarantee that they will serve public needs—as so many dead public plazas and parks in cities around the world can attest. What makes an urban space truly ‘public’ depends on its ability to generate different ways of being and interacting among diverse segments of the population—neighbors, strangers, tourists, and everybody else that moves through the city. A ‘successful’ public space arguably requires two features; a mixture of activities that occur within and around the space (with limited restrictions), and some form of public involvement in the governance of the space. As Tom Borrup writes for the Project for Public Spaces, “When people become involved in the design, creation, and upkeep of places, they develop a vested interest in using and maintaining these spaces. When they have a true sense of ‘ownership’ or connection to the places they frequent, the community becomes a better place to live, work, and visit. The residents’ feelings of respect and responsibility for the place bonds them to that place and to each other. No architect or town planner can design or build a place that does that.” Rather than just planning and designing public spaces (like Alshaheed Park), city and state governments should focus on creating urban policies—for instance, looser zoning and licensing laws—that allow such community spaces, social activities, and experiments in living (like the Secret Garden) to emerge more naturally. Al-Nakib, Farah. (2016). Kuwait Transformed: A History of Oil and Urban Life. Stanford, CA: Stanford University Press. Al-Nakib, Farah. (2014a). “Inside a Gulf Port: The Dynamics of Urban Life in Pre-Oil Kuwait Town.” In The Persian Gulf in Modern Times. Edited by Lawrence G. Potter. New York: Palgrave Macmillan. Al-Nakib, Farah. (2014b). “Public Space and Public Protest in Kuwait, 1938-2012.” City 18, 6: 723-734. Bockman, Johanna. (2015). “Home Rule from Below: The Cooperative Movement in Washington, DC.” In Capital Dilemma: Growth and Inequality in Washington, DC. Edited by Derek Hyra and Sabiyha Prince. New York: Routledge. Borrup, Tom. 2006. Creative Community Builder’s Handbook: How to Transform Communities Using Local Assets, Arts, and Culture. St. Paul, MN: Fieldstone Alliance. Harvey, David. (2012). Rebel Cities: From the Right to the City to the Urban Revolution. London: Verso. Tétreault, May Ann. (2012). “Looking for Revolution in Kuwait.” Middle East Research and Information Project. Tonkiss, Fran. (2005). Space, the City and Social Theory: Social Relations and Urban Forms. Cambridge: Polity Press. 1. The Diwan al-Amiri represents the executive branch of government in Kuwait. 2. For a comprehensive analysis of Kuwait’s post-2011 political opposition movement, including the historical context in which it emerged, see Tétreault 2012. For a spatial history of political opposition movements in Kuwait, including the 2011 movement, see Al-Nakib 2014b.